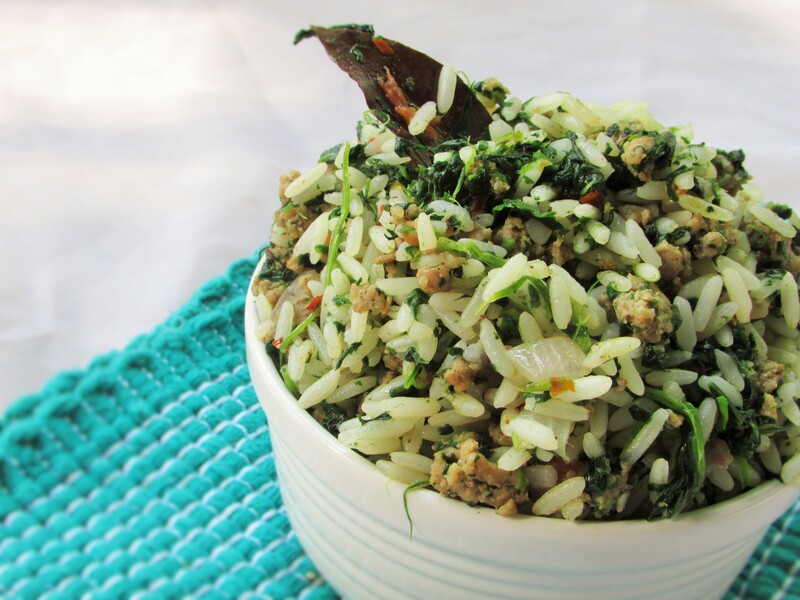 Easy Spinach, Mince Meat And Rice Stir Fry. I decided to take my #fitfamness seriously. I realized I had been lazy, so I went running “couch to 5k” and it actually helped as I could climb the steps without panting. Anyway, I decided to do a quick rice and spinach recipe for my ajebutters as we were all tired. I had a bowl of bulgur to use for my portion, but I quickly forgot all about the bulgur due to me and the kids talking and before I knew anything, I had about 2 small bowls of rice. Sigh! It was that good you guys. This recipe is so easy, you may make it with any vegetable and any grain of rice of your choice. It is also great with bulgur and quinoa. You may easily make it vegan by taking out the mince meat and the seasoning cubes and use soy sauce. Heat 2 tbsps. of coconut oil in a wok or sauté pan. Drop in the bay leaves; add the curry and thyme and let it fry for some seconds without burning. Add the onions and sauté until almost translucent. Add the ground meat(If using) and sauté until cooked through(it will look a little pale).Add the tomatoes and stir until reduced a little. Add the garlic, ginger, spinach, knorr cubes(or soy sauce) and cumin of using any. Mix well on high heat; then pour in the rice and stir fry well. Season with salt to taste and set aside. 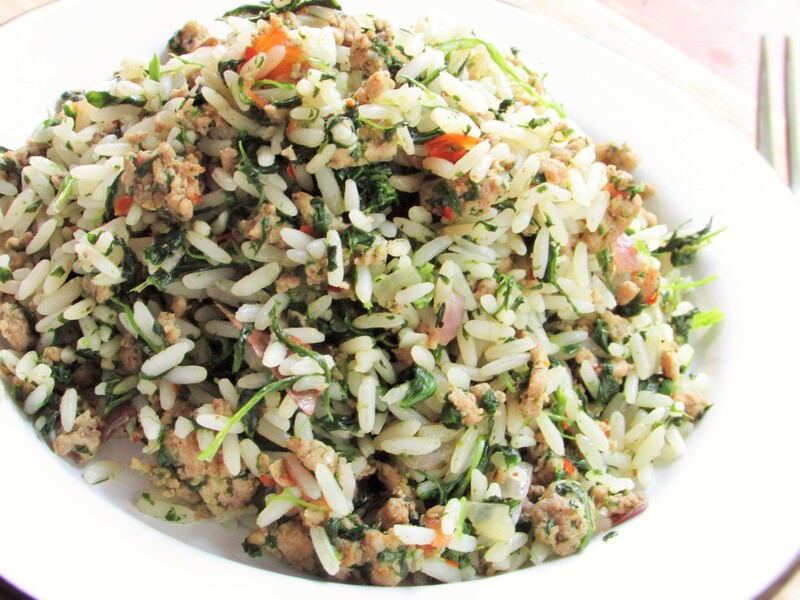 This entry was posted in Fried Rice, Lunch, main dishes, main meals, Nigerian Fried Rice, Nigerian Rice Recipe, Rice, Rice Dishes, Side dishes, Sides, Starch, Stir fries, Stir Fries, Stir fry, Uncategorized and tagged carbohydrates, Fried rice recipe, ground meat and rice recipe, Ground meat and rice stir fry recipe, ground meat fried rice recipe, healthy Nigerian, healthy Nigerian recipes, mince meat and rice recipe, Mince meat fried rice recipe, Paleo recipes, rice and ground meat recipe, rice and kale recipe, rice and spinach recipe, vegan recipes, vegetable and rice recipe, vegetable and rice stir fry, vegetable and rice stir fry recipe, vegetable rice recipe, veggie and rice recipe. Wow you really inspire me with your recipes, i am going to try this. Thanks a bunch.